With our page size set, we continue with the global settings, and in this post we cover page layout and margins. Open your saved Word document. If you didn’t save it, create a new document. I suggest you save your Word document as we’ll be adding formatting features, and it’ll be useful to do them all in the one document. 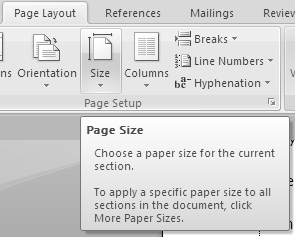 With your page size set, the next setting you need to do is the page layout. If you are designing a hard copy book it’s essential to design your pages for double-sided printing. Actually, it’s a good idea to always design your book like this; even if you’re creating a PDF ebook (you could even use it as a selling point to tell your readers that the ebook has been designed for double-sided printing, like a “real” book, which they can then have spiral bound). Click the Different odd and even checkbox in the Headers and footers frame (see below). This will enable you to create different headers and footers for the odd and even pages; this is often found in a hard copy book. If you’re going to design a PDF ebook that you’re going to sell off your site, click the Different first page check box. This will enable you to insert a cover graphic image on the first page, and it will be separate from the rest of your book. Or maybe you want to use Word’s feature for a cover page. This is not applicable for the design of a hard copy book, as your cover will be a separate file. Headers and Footers (From edge). It’s not essential to change these settings, unless you want to create a special book design – something that looks very different to the norm. No need to change the Vertical alignment setting at this stage. This setting can be changed if you have Section or Part dividers in your book, and will be discussed later. Leave the Apply to setting as is at this stage. Your book is still only one page. No need to use Line numbers – these are usually only used in legal documents, or academic papers. I would not recommend using Borders on the content pages of your book – it reflects an amateur look. You could use borders on Part or Section dividers if you want to. We’ll cover this later. When you are done, you can proceed to set your page margins. 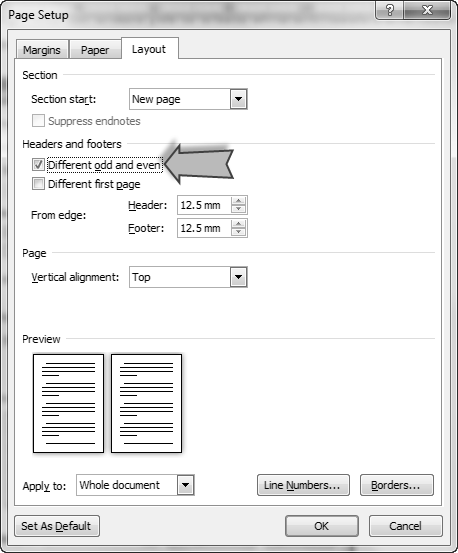 After your page size and layout is set, the next setting you need to do are the margins. NOTE: This will usually be done in sequence with all your page layout settings, but I have explained these steps separately. Click the Page Layout tab on the menu bar, then click and open Margins. On the drop-down menu, click Custom Margins (at the bottom of the menu). The Page Setup window will display. Click the Margins tab. Choose the margin settings in the relevant fields (see below). 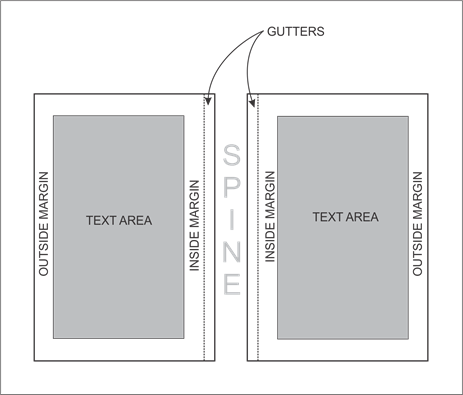 If you are designing your book for double sided printing (essential for hard copy books, and it can be a good idea for PDF ebooks as well), keep in mind that you should set your margins differently for Inside and Outside margins. This is how professional books are designed, and the reason for this is to allow for the binding. The sizes in the example below are for a 6″ x 9″ book size. The use of white space makes your book easier to read, especially if it is non-fiction. For this reason, when you choose your margin sizes, don’t be frugal (but also don’t go overboard). Type the size for the Top, Bottom, Inside, and Outside margins, in the relevant fields. The Inside margin is the left-hand margin, on a right-hand page; the Outside margin is the right-hand margin, on a right-hand page. Vice versa for left-hand pages. The Gutter is used if you are going to have your book spiral bound. This is like a “no man’s land” area, where no text will appear . After you have made the settings, you can click OK and check what your page looks like. If it’s not suitable, return to the Page Setup window and make changes. The diagram below illustrates the Inside and Outside margins. NOTE: Usually the Inside margins are wider than the Outside margins, to allow for the binding. Only in special circumstances, would you change the Orientation to Landscape. 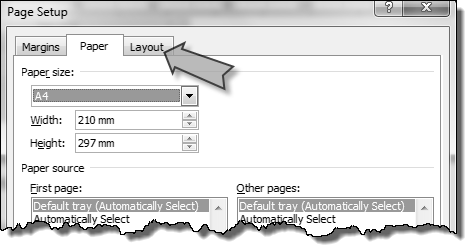 In the Pages frame, choose Mirror margins from the Multiple pages drop down menu. This will automatically create your left and right-hand pages, with the correct margins, as you develop your book. 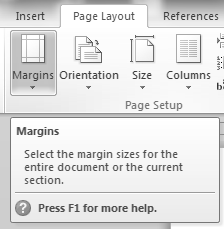 If your inside and outside margins are the same size, then this option is not essential – you can leave it as Normal – but this is not suggested. 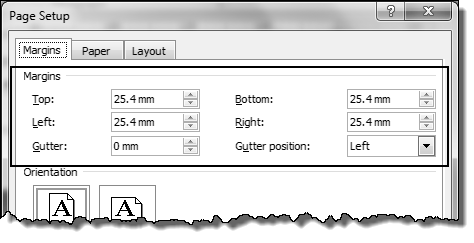 The last setting on the Margins screen is the Apply to setting. Again, make sure this is set for the Whole document. You’re done with your page setup. That wasn’t so tough, right? When you are done, you can click OK. In the next post, we continue with global settings, and look at Base Font and Line Spacing. Pingback: AME Blog Carnival: May 5, 2014 - Author Marketing Experts, Inc.